We arrived home safely, though a couple hours late, on Friday night, 9 pm. It’s amazing we made it home when we did, because we almost missed two flights. We made both connecting flights (San Fran-Chicago/Chicago-Madison) thanks to both those flights being delayed. Close calls! Once we were on the flights, things went mostly well. People were so patient and happy for us and Kajsa, and eager to hear about her. Sleep was an issue at times. Fortunately there was an empty galley behind us on the long flight. We used that frequently. 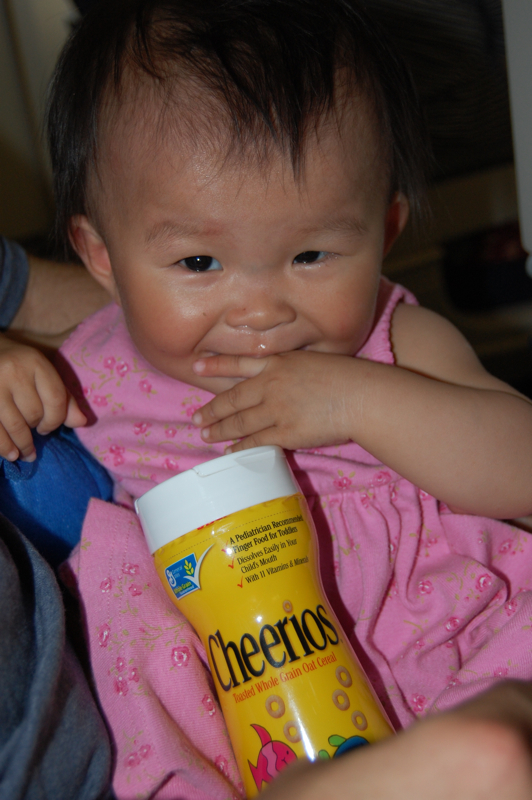 And Cheerios and noodles were our friends on the whole trip. We are still exhausted, but loving being with Kajsa. And family. And friends. And the dogs… Abby was here when we got home on Friday, Entropy came “home” today, for a bit, until he moves to Alaska. 😦 Can’t talk about that right now. Jim’s parents and Karen, Dave, and Laura met us at the Madison airport. What a fun welcoming party! The Hinz clan had made signs…adorable. Kajsa, by this point, was used to being the center of attention from the moment we entered the Hong Kong airport. So she loved this “crowd”, watching her, talking to her, taking pictures of her.. and she happily obliged them by waving, smiling, laughing.. even through her pure exhaustion! We came home to a fully-stocked fridge and pantry, thanks to good friends and family. Joan and Dan had stocked up on some essentials, Jen & Roy, Sandie & Co., and Chenrui had stocked us with plenty of essentials, and Karen and Dave and Laura brought some essentials to the airport as well: lotus buns! Joan and Dan had lotus buns specially ordered for Kajsa (from a bakery in MN); Chenrui had made steamed buns; and the Hinz’ brought us two packs of frozen lotus buns! This baby has been well-stocked, and very happy with the continual supply of her favorite food so far. She is also thrilled with the endless audience she has had. Family and friends have been here much of yesterday and today, and it has been both helpful and fun. Kajsa hams it up, sings, waves, eats lotus buns, laughs, plays… and overall loves people. And, also important, she and the dogs are getting along well now. Friday night was iffy. She was quite afraid of Abby, but now she loves to pet her, look for her, and treats Entropy the same way. All in all, things are going well. We’re needing a bit more sleep, as Kajsa’s sleep patterns are still not great. But, hopefully that will change. Hopefully. The boat has been slowly making its way to China…for three years! And finally, on June 24th, we depart. We fly from Madison to Beijing, via Chicago and San Francisco…We arrive in Beijing on the 25th. 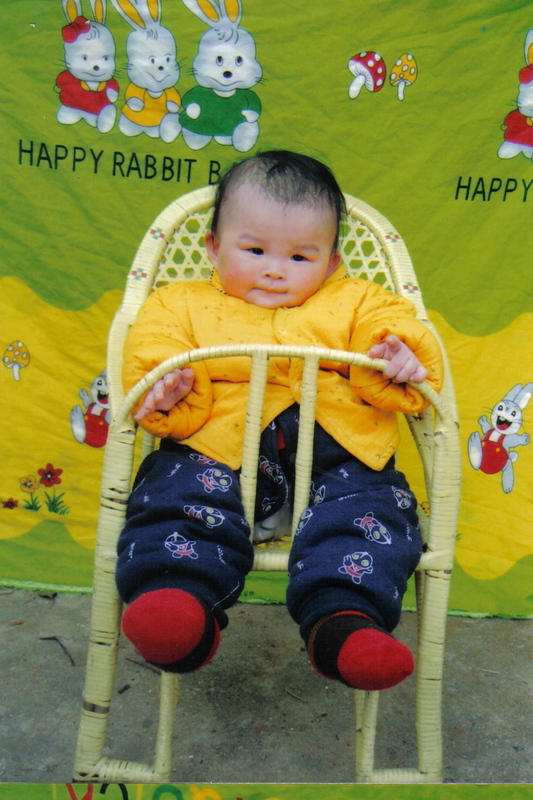 We will have a couple of days in Beijing to catch up on sleep (jet lag.. not that we’re saving up sleep until we arrive in a foreign country), explore Beijing, go on a couple of tours with other adoptive parents who are in Beijing. And, hopefully, we will meet Kajsa on either the 29th or 30th! We’ll fly to her province on the 29th, I think. So, that’s the plan for now. Our tickets are booked (Thank you Dan and Joan for the miles! )…and it feels a bit more real, now. A bit. I guess it’s actually felt a bit more real in the past week or so, but today, having an itinerary in hand feels even more of a bit real. The excitement and even the stress of thinking we were leaving June 9th or 10th was huge. It became the only thing we could think about (which was a nice break! ), meeting Kajsa before she even turned 11 months old. Well, no longer. Turns out that we probably should never have received an email saying we might travel next week–because it wasn’t even possible! We found out a few days ago that we probably would not be traveling next week. Then yesterday morning we found out that we cannot travel until the week of June 22nd. Sigh. So, Jim and his father are working on flight itineraries, and hopefully we can confirm today. As soon as we have the confirmed date of travel and return from China, I’ll post it. And the best news: we’re still on our way to meet Kajsa! We received an email from our agency on Friday afternoon that our Travel Approvals (TA) arrived! This means that China has approved our travel to their country. Now we wait for the agency and the American Consulate in Guangzhou (CHINA) to set up our appointment… then everything works backwards from there. BUT, the big news in that email from the agency, was that we could be leaving as early as next week! COULD be. It all depends on the consulate appointments. Needless to say, we’re in speed-up/stressed-out/excited-beyond-belief/prioritizing mode. Obviously there are some things that will not get done at this point, before we bring Kajsa home. Then there are some things that have to be done before we leave. So, after years of waiting, we’re finally on the fast track, and it seems a bit out of control. Yet fun at the same time. Jo Ann was here last week and she and I rearranged some furniture in the dining room/mess room/and living room. Now I need to rearrange the junk that belongs in those rooms. Last night I officially finished painting Kajsa’s room, and today I’ll touch up her crib with white paint, before putting that in the room. In case you haven’t figured out yet, “Kajsa” is pronounced like “ice-a”, only with a “k” at the beginning. Kajsa is a Swedish name, commonly used as a nickname for “Carin”, and also a derivative of “Katherine”, meaning pure. None of these are the reasons we chose it, however. We simply like it. And yes, the voting results are now showing “Kajsa” on top, but it’s also our favorite at this point. We are very excited. And we wanted to keep part of our baby’s Chinese name as her middle name, and like the fact that children brought to her specific orphanage are given the last name “Ling”, so thought we’d keep that part. Continued thanks for your emails, support, votes, prayers.. and please, continue to pray for the country of China and the millions affected by the earthquake and after-effects. Ok, this is purely for fun. Don’t worry… we will pick the name that we, Jim and Cathy, think is the best fit for our daughter. But we also thought it’d be fun to have a poll on the blog. So, which name do you like best? Click on this “Click Here/Cast your Vote” button below, and cast your vote. And check back for the name.. someday! And many thanks to Dave, for creating the poll for me! !